My community is scarcely nine months old as I sit down to write, and will be having its first birthday as this issue goes to press. We were founded with entrepreneurship at the core of our vision, and we’ve already learned a great many lessons about how to manage businesses operating in our shared space—and how not to! Our story started with three women who were ready to commit to the dream of “Avalon”: land where women and their loved ones could pursue their spiritual paths and live in deep harmony with the natural world. Exactly four months after we held a community council about finding this land, we signed papers and moved in to a beautiful little homestead on a Vermont dirt road, complete with a cozy cabin, a goat pasture, a chicken coop, a babbling brook, and towering white pine trees. Through a series of miracles (a.k.a. a USDA rural development loan) we managed to buy this land with no money down, no closing costs, and a low-interest mortgage (title held by one member). Our dream was coming true even though we had no savings! One of our founders already owned the 12 acres and two off-grid cabins next door, known as Dragon’s Gate, and this new 1.5 acre parcel would be a community space and an incubator for our dreams. We named this incubator Dragon’s Nest, the perfect place to hatch our dreams-eggs. We’d use the space to grow our small businesses, simultaneously creating the financial abundance to purchase a bigger chunk of land nearby, and expanding the community of people who felt connected to our vision. When we moved in, there were six people living at Dragon’s Gate and Dragon’s Nest: the three founders, a community-loving friend who wanted to rent for a while, and two children. When we started looking at land, two of us already had small businesses up and running: Liberty Chocolates had been operating for a few years and had several employees; Mountainsong Expeditions was a start-up wilderness company, officially incorporated but consisting mostly of a nice website and the enthusiasm of its sole proprietor. Our third founder dreamed of eventually starting a baking business and of putting her midwifery training to good use in the local community. When we discovered our dream property, the central element in the plan for financial stability was for Liberty Chocolates to move its manufacturing operation into the cozy cabin, with the wilderness guide living in a tiny house in the front yard (one she’d built on a flatbed trailer that could be towed to the land on closing day). Our baker planned to move into the first-floor bedroom of the 460-square-foot cabin at first, but to be living in a yurt in the pasture by snowfall, leaving the entire cabin to be a chocolate factory by day and a community space at night, hosting hot showers, internet use, and weekly community dinners. That is not how it worked out, at least not for long. As we rushed to secure our perfect piece of property, we ignored classic communities-movement wisdom and neglected to put much of our dreams in writing. Since we planned to create a legal structure for shared ownership soon after the purchase of the land, we didn’t bother to create leases for the residents. The day we moved in, we suddenly realized the space was going to be a little too small for all of our dreams to share. The baker decided she would not be ready to purchase a yurt before winter, which left our chocolatier scrambling to figure out what room she would use to cool her chocolate bars after winter arrived in the toasty little wood-heated cabin. The house was bursting at the seams from trying to hold both a manufacturing business and a woman’s primary home space in such a modest square footage, and plans for building an additional wing proved financially out of reach. It didn’t help matters that the wilderness guide, who had done years of research into legal and social structures for intentional communities, was away in the mountains for much of the summer. Amid mounting frustrations on all sides, planning for shared legal ownership completely stalled. By August our chocolatier realized that her business was growing much faster than anticipated and heard of an ideal commercial kitchen space nearby. She announced that she was moving her business out in one month and taking her rent money with her so she could pay for the new space. Up to that point Liberty Chocolates’ rent had constituted more than half of the monthly mortgage and utility payment, but we had no legal agreement binding her to that contribution. While we all wanted her business to thrive, we wondered if our community would survive this financial crisis. Two residents came very close to moving out that month, but at last we talked through the emotional tangle and came to a new agreement: everyone voluntarily raised their rent to help cover the financial shortfall, and everyone signed a lease that put their monthly financial commitment to the mortgage-holder in writing until the following May, at which point we would either revisit the idea of shared ownership or extend the leases. Whew! Disaster averted. The cabin would remain community space except for the baker’s bedroom. However, as Liberty Chocolates was taking its leave, Mountainsong Expeditions was just getting started. In October the wilderness company hosted a sold-out women’s deer hunting workshop on the land (participants pitched tents on the lawn and heated up potluck food in the tiny cabin kitchen), followed by a successful hide-tanning workshop the next weekend, a bow drill fire class in December, and an herbal first aid training in January. This form of sharing space proved much more sustainable: a class would descend on Dragon’s Nest for one weekend and be gone, cleaning up all their messes before they left and leaving the cabin to be a home again during the week. Mountainsong Expeditions benefited by not having to pay a fee to use the space that first year, and hopes to prosper enough to voluntarily contribute to Dragon’s Nest’s finances in the future. ● Make firm legal agreements before purchasing land, so that the distribution of financial support for the land is clear, committed, and realistic. ● Learn about the money style of your cofounders so you won’t be surprised in the future. Some people are spenders, some are savers, some like to borrow and some loathe it. Share your credit scores and how they came to be. Talk about your class background and your money triggers so that you can understand each other’s attitudes. Sometimes you aren’t aware of your money triggers until someone sets them off, but make a good effort to share with as much self-awareness as you can before misunderstandings arise. ● I’m very glad that we drafted our mission statement at our first community meeting. It took us many months to finalize it, but referring back to those original drafts reminded us than our core values and purpose haven’t changed since we started. ● Be realistic about how much space each person and business needs. Don’t forget to plan for growth—Liberty Chocolates was expanding rapidly that summer, which was one reason why it made sense for them to move to a new location. None of us had expected their growth to come so fast—our “incubator” hatched that egg much sooner than we anticipated! Have an exit plan if you expect your business will eventually outgrow the site. ● Have good financial boundaries. Get approval for shared expenses BEFORE anyone fronts the bill expecting repayment. Don’t assume anything. ● Shared legal ownership comes with shared legal liability. Make sure all members are ready for this commitment and are being realistic about it. In our case, the financial chaos of changing rents made us take a step back from this level of financial interdependence. Reverting to singular ownership with individual leases created a less radical structure, but the reduced commitment level is what enabled us all to stick out the experiment a little longer until we could make our community arrangement more functional. You can still build a strong community without shared ownership. The euphoric “founder’s joy” of new communitarians wears off very quickly in the chaos of financial instability. I spent many of my initial months at Dragon’s Nest with one foot out the door (my tiny house, after all, is on wheels), wondering if it was all going to work out and how long I could stand the chaos in the meantime. In the end it was our shared values and shared vision that saved us. Each of the founders was committed to achieving clear communication, we all framed the experience as an opportunity for spiritual growth, we all brought a lot of emotional courage to our meetings, and we all believed strongly enough in our vision of sacred land and feminist community to stick it out when the going got tough. Each resident has had to adjust their expectations of how they will contribute to this community, but we’re all still here. 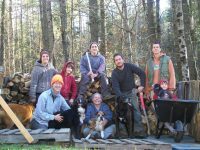 Mary Murphy is a founding member of Dragon’s Nest Cooperative Homestead in central Vermont, which she shares with four adults, two kids, and various goats, chickens, rabbits, dogs, and llamas. From Dragon’s Nest she runs Mountainsong Expeditions, a small wilderness company which offers spiritually-based wilderness trips and classes on The Sacred Hunt. You can see a photo gallery of Dragon’s Nest on her website: www.mountainsongexpeditions.com/dragons-nest.html. Mary also recommends that you treat yourself to a true luxury and experience the amazing sweets available for purchase at www.libertychocolates.com. You can read more of Mary’s writing in the book Stepping Into Ourselves: An Anthology on Priestesses. 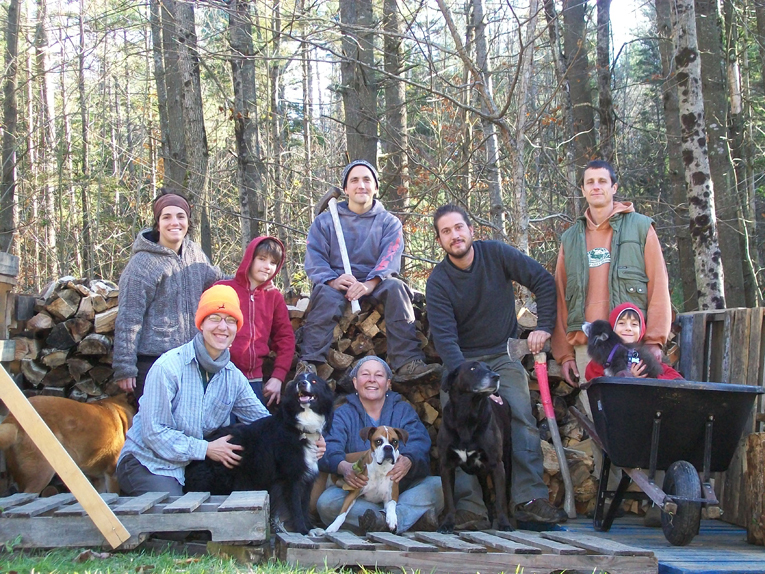 ← Bookstore Special: Ecovillage at Ithaca!